Teri Hatcher first rose to fame in 1993 when she landed the iconic role of reporter Lois Lane opposite Dean Cain's Clark Kent/Superman in Lois & Clark: The New Adventures of Superman. After the popular ABC series went off the air four seasons later, the actress played Bond girl Paris Carver in the Pierce Brosnan-led Tomorrow Never Dies. However, most people know this TV regular for her starring turn as Susan Mayer on Desperate Housewives between 2004 and 2012. The critically acclaimed dramedy served as the second wind of Hatcher's three-decade career, with her fan-favorite girl-next-door performance scoring her a Golden Globe, a Screen Actors Guild Award, and an Emmy Award nomination for Outstanding Lead Actress in a Comedy Series. This leading lady has by no means lost her household name status since leaving Wisteria Lane behind. However, her professional endeavors haven't been quite as attention-grabbing as we previously expected due to a string of short-lived projects, rumors about her appearance and attitude, and more. Keep reading to find out the real reason why you don't hear from Teri Hatcher anymore. Was her bad rep justified? Over the years, Hatcher has developed a bad reputation in the entertainment industry for her alleged penchant for a diva-ish behavior. Of course, the infamous rumors surrounding the supposed feud between the actress and the rest of the Desperate Housewives cast have been circulating since the show's first season. But it turns out even Tomorrow Never Dies co-star Pierce Brosnan once had a bone to pick with Hatcher. "I got very upset with her," he told Vanity Fair Italia in 2005 (via The Telegraph), claiming that the on-screen Bond girl would often arrive late to set. "She was always keeping me waiting for hours. I must admit I let slip a few words which weren't very nice." To be fair, Hatcher was apparently suffering from severe morning sickness while pregnant with daughter Emerson Tenney at the time, so we'll cut her some slack for her late arrivals. Ultimately, the hearsay surrounding her alleged bad rep is just that — pure speculation. However, it may have unfortunately led to widespread perception in Tinseltown that Hatcher is difficult to work with. Shortly after Desperate Housewives went off the air, Hatcher took a surprising break from acting altogether and enrolled in Los Angeles' Cordon Bleu cooking school. "It was the first chance that I could do something else so there was this question, what do I want to do?" she told the Mirror in 2013, adding, "I felt so lucky to be in a position where I could try something new and challenge my brain, get a different perspective and learn new skills. I have always loved cooking … but it is still a far leap from being a recipe-follower to being a chef." After completing this full-time, year-long course, Hatcher showed off her culinary skills on The Great Celebrity Bake Off for Stand Up to Cancer in 2018. As a longtime fan of the series, the actress-chef later told Loose Women, "It was the best experience." Hatcher impressed the judges and social media users alike during her appearance, according to the RadioTimes, and was ultimately crowned Star Baker. However, her win largely went unnoticed back home in the States as the special only aired on the tele across the pond. Has she altered her appearance? Teri Hatcher has often spoken out against the unrealistic expectations placed on women's looks, especially as they age in the entertainment industry. Amid a round of cosmetic procedure rumors in 2010, she posted a series of makeup-free selfies on Facebook, writing in part, "Love it or hate it, my face that is, no surgery, no implants, no matter what 'they' say" (via HuffPost). The actress came clean about about a few things, sharing, "Did I every toy with fillers or Botox over the years? yes." However, her overall message was to "reveal some truths about 'beauty'" in the hope that "it makes you all easier on yourself." Despite this transparent approach, Hatcher has been forced to continually dodge plastic surgery and Botox speculation in more recent years. Piling on to the harsh online criticism she's faced over her seemingly altered appearance, a couple of "experts" even weighed in on the matter to Life & Style in 2018. Whether or not there's actually any truth to this hearsay remains to be seen, but we think Hatcher should just do whatever works best for her. Hatcher's career took a surprising turn toward voice-over work after Desperate Housewives wrapped, which might explain her lack of an on-screen presence between 2012 and 2015. After catching the voice-acting bug in Henry Selick's 2009 feature Coraline, she went on to voice Silver Skylark in Stan Lee's Mighty 7, Dottie in Disney's Planes franchise, and Beatrice Le Beak in the Disney Junior series Jack and the Never Land Pirates. "I love animation," Hatcher told the Daily Mail in 2013. "But the greatest thing about Disney is that they take these very relevant issues, like 'I'm going to push myself outside of my comfort zone and I'm going to take some risks in order to reach that thing I really dream of.”' She added, "I can't think of a more human story than that." While these animated gigs ultimately did little to bolster Hatcher's presence in the public eye, she was working steadily — just not where audiences could see her. Hatcher's first major TV gig following Desperate Housewives was on CBS' remake of Neil Simon's classic play The Odd Couple. According to Entertainment Weekly, the actress began taping her guest-starring stint in 2015 (her episodes aired in 2016) as single mom Charlotte, the love interest of Oscar, who was played by Friends alum Matthew Perry. Of the TV veterans' on-screen kisses, Hatcher told Extra TV, "[It's] that respectful thing, with the newness of somebody, where you're like, 'I'll go get some gum. I just had coffee. I'm so sorry.' I said to him today, 'I'm over the coffee breath thing, you can have whatever kind of breath you want.'" Despite Hatcher and Perry's on-screen chemistry, the series itself was poorly reviewed. Receiving just a 26 percent score on Rotten Tomatoes, the site's critical consensus read, "Stars Matthew Perry and Thomas Lennon make a fine Oscar and Felix, but The Odd Couple's flat jokes and canned laughter are pretty old hat." Ouch. According to Deadline, the show was the lowest-rated comedy on CBS in 2017, which ultimately led to its cancellation after three seasons. Hatcher made every comic geek's dreams come true when she returned to the DC Universe as the villainous Rhea, a.k.a. the Queen of Daxam, on Supergirl in 2017 (via Entertainment Weekly). The actress' performance in this multi-episode, second season story arc marked a stark departure from her previous work. 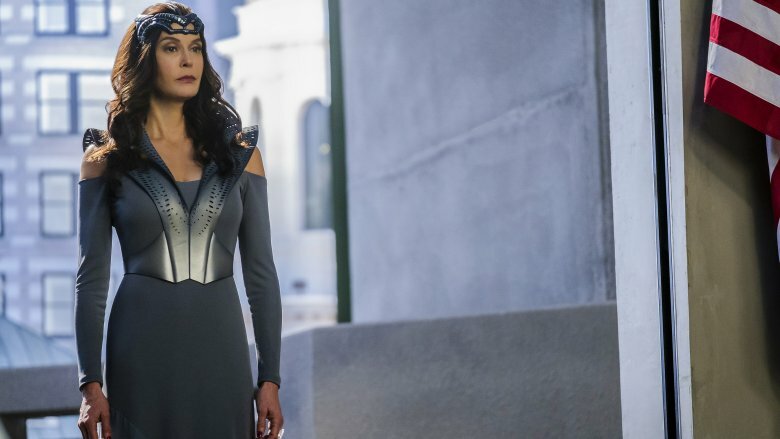 Executive producer Andrew Kreisberg, who was later fired from The CW over sexual harassment allegations, told IGN, "What's so amazing is, she is so not playing Lois, and she is so not playing any character I've ever seen her play before. She's so not Susan from Desperate Housewives." He added, "She's really playing something completely different that was in her repertoire of all the things that's she's ever done, and she's doing it amazingly. It's really exciting for us." For her part, Hatcher couldn't contain her excitement about the gig and wrote on Instagram, "I'VE ARRIVED… So happy to be joining the cast of @supergirlcw." However, her run on Supergirl didn't last very long as her character — spoiler alert! — died at the end of her eighth episode. As Rhea left the realm of the SuperWorld, so did the press surrounding Hatcher's guest-starring turn. In 2017, Hatcher began creating her own content on her YouTube channel, Hatching Change, which marked an apparent departure from Hollywood. As of this writing, this Youtuber's online shows have included Van Therapy and Don't Eat "It" Out of a Box. "I travel around Los Angeles in my 1978 VW bus camper, looking to connect with people willing to talk to me about all things big and small," Hatcher said of the former to Haute Living in 2018. Meanwhile, she's used her culinary background to offer healthier alternatives to processed foods in the latter. "I'm changing diets and lifting spirits of those I actually meet and for those who watch the channel," the multi-talent continued. "When I read the comments from people whom I've helped, I feel a great sense of peace and accomplishment." She later told Entertainment Weekly that she loves the "immediacy" of social media connectivity, saying, "I'm trying to just put out even the smallest amount of positivity out there." We love the work Hatcher's doing to affect change in people's lives, but her channel hasn't exactly been a major hit in the online sphere. As of this writing, Hatching Change has just over 9,800 subscribers. In March 2018, Teri Hatcher faced a rumor so outlandish, we can't help but wonder: Is there really no such thing as bad publicity? According to People, a Star magazine cover story alleged that the actress was broke, homeless, and living in a van at the time — you know, the one she uses to film her YouTube series, Van Therapy. Of course, this tabloid fodder was "categorically not true," as Hatcher herself later said in an interview with KTLA. While her lawyer and publicist had already told the gossip rag that the report was untrue a couple weeks prior, she said, "They went and ran it anyway. And that is even more egregious that it was so purposefully hurtful." Lending her voice to the #MeToo movement and Time's Up initiative in Hollywood, Hatcher used this ordeal to highlight how tabloids have a tendency to attack women. "They're fostering a culture of disrespect — of trying to take down and take away the power of women," she said, also calling these types of stories "a kind of harassment and bullying that we can't take anymore." Well said. When Hatcher isn't acting or creating her own online content, she's most likely devoting her time and energy to philanthropic work. The actress is known for running marathons alongside daughter Emerson Tenney to raise money for charity, and has used her celebrity platform to advocate on behalf of children's issues, humanitarian relief, and healthcare, according to Look to the Stars. However, as a survivor of childhood sexual abuse, she's most notably sought to prevent violence against women. After publicly opening up about her experience for the first time to Vanity Fair in 2006, Hatcher spoke at the United Nations' International Day for the Elimination of Violence Against Women event in 2014 (via E! News). While voicing this sense of outspoken activism, Hatcher told Thanksgiving & Co. what she wished for the world in 2019: "That we see each other with compassion and act accordingly, that we are more aware of our impact on the Earth, and that we try to behave leading with kindness, generosity, and empathy." We truly couldn't agree more. There's no denying that TV reboots are all the rage these days. From Fuller House to Will & Grace, audiences are enthusiastically tuning in to see where their favorite on-screen characters have ended up decades later. For her part, Hatcher would love to go back to Wisteria Lane, having told Loose Women in 2018, "I'd be the first person [to return]. I never wanted it to be over." However, a Desperate Housewives reunion seems pretty likely. In addition to the cast's supposed feud, most of Hatcher's former co-stars aren't too interested in getting back together. "It's not going to happen," Felicity Huffman, a.k.a. Lynette Scavo, bluntly told Haute Living. "I think [writer and producer] Mark Cherry ran through all the stories ― and then some. The well is empty. Now it would be called Desperate Old Biddies." To be fair, Huffman's since become embattled in the celebrity college admissions bribery scandal. However, Eva Longoria, who played Gabrielle Solis on the series, told Closer Weekly that she'd reprise her role "in a heartbeat," but noted, "Our showrunner doesn't want to do it." And we suppose that's that. 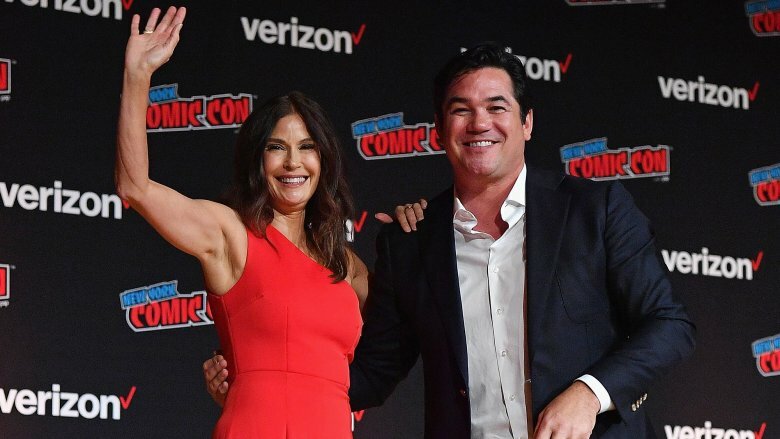 Hatcher reunited with former Lois & Clark: The Adventures of Superman co-star Dean Cain to celebrate the series' 25th anniversary at New York Comic Con in October 2018, where the duo teased a possible revival of the popular DC series. "Of course," Hatcher said when asked if she'd be up for an on-screen reunion (via The Hollywood Reporter). "That would be amazing," For his part, Cain chimed in with, "I think it needs more than an episode. I would love to see what Lois and Clark are up to [now]. The possibilities are endless." Indeed! After sharing their own theories about what happened to their iconic alter egos after the show ended, these two revealed that they'd already taken steps to reboot the project. "I got as far as some people at Warner Bros. It's a complicated sell because they have their own plan for the superheroes [and where Superman fits in]," Hatcher said, to which Cain quipped, "Maybe that's why Marvel is kicking their butts in the movies these days." Welp! He's not exactly wrong. Can she turn it around? While Teri Hatcher has spent much of her post-Desperate Housewives career out of the limelight, her upcoming appearance in the comedy crime film Madness in the Method might just kick off the momentum she needs to get her career back on track (via The Hollywood Reporter). As of this writing, the movie's release date has yet to be announced. Still, fans might find solace in the fact that Hatcher, for one, doesn't seem too concerned about maintaining her A-lister fame. "If I'm really going deep here, as a recent empty nester, and a long time single mom, and now at 53, I find myself asking pretty important questions," she told Haute Living in 2018. "'What are you doing with your life? What is your purpose? What are you passionate about?'" The multi-hyphenate added, "What I've found is that I'm delving into projects that I hope will help others and possibly leave the world a tiny bit better — and kinder — well, that's what's important to me." No matter what the future may hold for Hatcher, there's no doubt she has her priorities straight and will continue take on Hollywood on her own terms — which only makes us more excited to see what she does next!